Replacing your old modular office furniture is more than just a matter of calling a moving truck to take your old cubicles apart and moving in the new modular office furniture. After all, modular office furniture isn’t a “one size fits all” solution – you’re going to need to determine whether your current cubicles still fill all of your needs or whether you need to start looking at newer versions. Yes, you still need to know what it is you need, so you don’t overlook new features that will help make everyone’s workday easier. The cubicles you bought five, seven or ten years ago are different from the models made today. So, start exploring and learning what has changed since you last bought modular office furniture. The materials used to make today’s cubicles is stronger and lighter. They are made with new features that enable you and your workers to take advantage of today’s technology. All of this allows you to find new ways of working so you can streamline your work day. The call center cubicle has one function – to allow call center workers to make or receive phone calls. The cubicles are much smaller, taking up a smaller footprint, than those housing secretaries or managers. Cubicles may come with lower or higher walls. You decide what you need based on what your workers’ needs are. Some need more privacy and quiet; others have to work collaboratively, so they need lower cubicle walls. Also, that second set of workers may need to work in a pod that is separate from other groupings or rows of cubicles. These cubicles need to be able to physically adjoin with other cubicles. You wouldn’t just buy cubicles without knowing how many you need or how they will fit within your office space. Have an office planning expert come visit your office and take detailed measurements of every square inch so they can create a template of your own office. Using this, they will be able to advise you on how many cubicles you’ll be able to buy and even what sizes they should be. “But we already have cubicles.” True, but you may have decided to order several that will be larger. This is why you need that office planning expert. After all, you don’t want to order and take delivery of cubicles that won’t fit. We discussed the call center employees. You have other departments and employees who have other job functions. They may need more space, privacy and quiet, simply because of the nature of their work. Ask each employee to help you by outlining (briefly) their job functions, tasks and how they currently carry these out. Given the new technologies, such as tablets, you may find that what you currently have doesn’t work. Not only will you be studying the job functions of every employee, you will be learning how you can maximize every square inch of office space and update your modular office systems with today’s newest cubicles. Call us at Cubiture so we can show you what we mean. Browse our workstations and see what’s new. 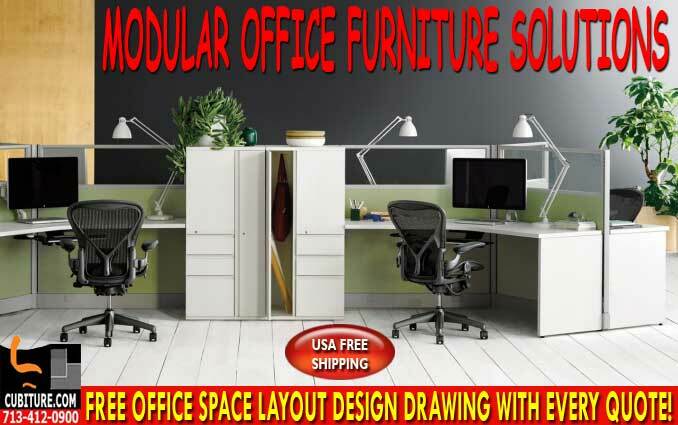 Call Us For A FREE Office Furniture Quote 713-412-0900. Visit Our Office Furniture Showroom Located On Beltway-8 between West Little York & Tanner Rd. On The West Side Of Beltway-8 In Houston, Texas.